So, you’re in the search of the best reverb pedal out there, but don’t know where to start? 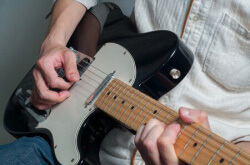 This guitar effect is very widely used, and for a good reason. Whether you use it discreetly to give your guitar that slight boost in presence and ambience, or to its full potential by emulating the acoustics of a church and flooding the stage with sound, finding a good reverb pedal isn’t always easy. Together, we will go over the most prominent specs and features, as well as reverb pedal reviews of some of the best selling and most popular models on the market. What Does a Reverb Pedal Do? How to Use a Reverb Pedal? In order to fully understand what certain specifications and features have to offer, you first need to have at least a rough idea of what the reverb effect does and how it’s used. Reverb simulates the sound of your guitar (or other instrument) bouncing off the walls of a large room. While this is a pretty simplified explanation, it will suffice. The main purpose of this effect is to add something like a 3rd dimension to your, already, stereo sound. Every sound you ever heard in your life has at least some natural reverb, as there is always something for the sound to bounce off and reflect. In terms of music, reverb is important because it adds a spatial dimension to the sound, that is most likely recorded in a studio with sound isolation. Basically, it gives you a more natural feeling of each note played. Chances are that you’ve already heard about, or even know something about delay pedals. How is a reverb pedal different from a delay pedal? While both of these effects are known as temporal effects, meaning that they modulate certain time-related aspects of your signal, there is still an important difference. Though reverb can be considered as a type of delay or echo, the time period between the actual sound and its delayed counterpart is very short, if not almost immediate. 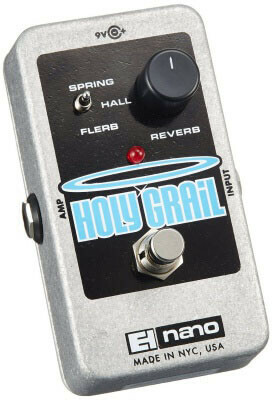 Sure, you could use a delay pedal, set the parameters correctly, and it will sound pretty much like a reverb pedal. But, if you plan on using this type of effect regularly, going with a dedicated pedal makes more sense. 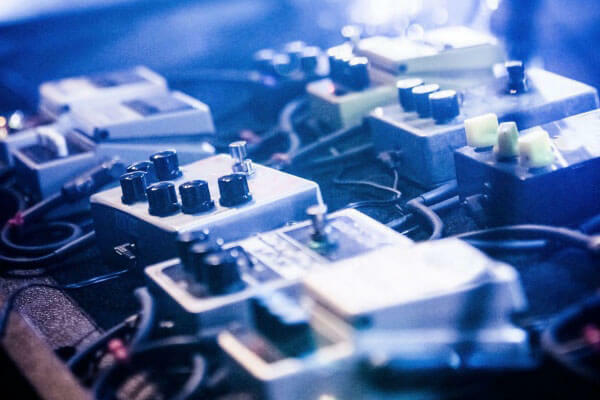 Although we’ve gone over the basic explanation of what a reverb pedal does and how it sounds, there are a couple of different circumstances you’d want and need this kind of effect. 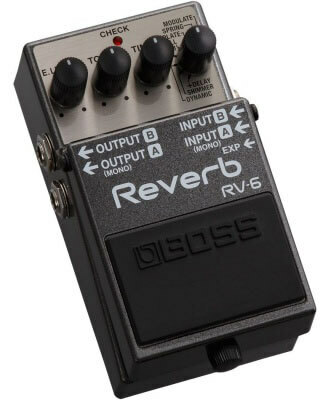 Many guitarists simply use a reverb pedal all the time. However, the settings are probably tuned down so it doesn’t stand out too much. It’s more of a subtle addition to an already shaped sound. Pretty much every kind of atmospheric/ambient genre or subgenre of music utilizes this effect. 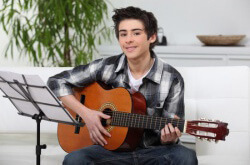 It’s pretty obvious why, as you truly achieve a much more broad soundstage and the riffs and melodies you play sort of fill the space around you more evenly and naturally. 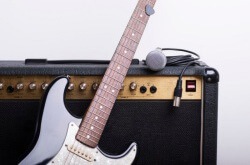 Faster genres such as thrash, heavy, or death metal probably once again use just a pinch of reverb because if they used any more than that, everything would sound just too mushy. So, ask yourself, why do you need a reverb pedal? Think about the genre or style of music you’ll be playing the most. This way, you can have a better idea of the type of reverb you need, as well as the features you may find to be useful. Generally speaking, there are multiple different variations of the reverb effect. However, in order to keep things simple, we can talk about just a few main types. As the name suggests, this type of reverb emulates the sound of your instrument being played in a large room or hall. Most pedals of this type offer a knob for controlling the “size” of the room in question, giving you the option of having the sound of a mid-sized room, up to a church with the effect being very noticeable. When this type of reverb first appeared, an actual metal spring was used! Nowadays, you can find a real spring reverb in some amps, but most pedals use an emulation, so, depending on the quality of the pedal, the results can be pretty different. Much like the previously mentioned spring reverb, a plate one uses the vibrations of a metal plate. Emulating these old-school effect types has gotten better over the years, so definitely check out some audio samples online to make sure that the sound suits your needs. Once you get a good idea about the differences in sound and application, ask yourself this question: Do you need a bunch of different types and presets of the effect, or just one that will most likely sound better than having numerous options? What are the most commonly found controls on a reverb pedal, and what exactly do they do? Dry/Wet – This knob basically determines how much of the effect is present in the signal. Dry means there is little to none, and wet means the signal is rich with the effect. Use this knob to tune in the exact amount of reverb you want to be heard. Time (Rate) – This parameter is used for setting the length of the echoes the reverb pedal makes. 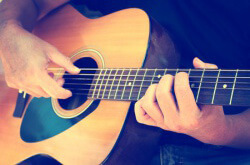 Depending on the type and tempo of your music, you can go for very short echoes, long ones, or anything in between. Different models offer different ranges with which you can play around with. While these are the basic controls, chances are that most models will offer more. In the review part of this article, I’ll make sure to cover what each additional knob brings to the table! If you’re using more than one pedal simultaneously, the actual positioning of each effect in the array can make a huge difference in terms of the end result and sound. 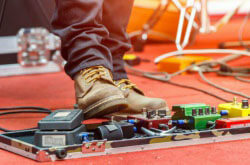 Reverb and delay pedals are generally placed at the end of your pedal chain, right before the amp. 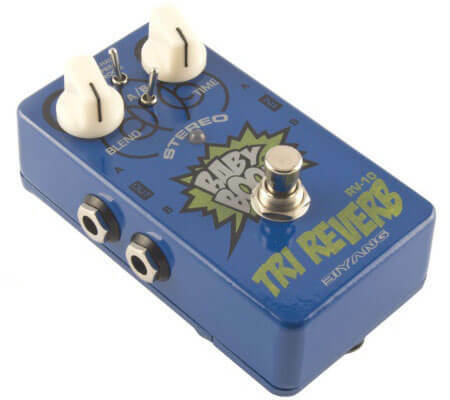 If you placed a reverb pedal before, for example, an overdrive effect, both the original and duplicated sound would be colored by the overdrive, which is something that you, in most cases, don’t want. While this is a rule of thumb, don’t be afraid to experiment! If you already have an amp with a built-in reverb effect, should you get a pedal? Well, it all depends on what you’re looking for and how the built-in reverb sounds. If you have a tube amp with a real plate or spring reverb, you probably don’t need an additional pedal. If, however, you have a modeling amp or something similar, with a digital simulation of this effect, chances are that it doesn’t sound really good. Unless you can control that built-in reverb via a footswitch, it’s practically unusable when playing on stage. So, once again ask yourself what kind of reverb do you want and need, and if you really need it! This factor often gets neglected when talking about reverb and delay pedals. While most guitarists would go for true bypass pedals without even thinking about it, there are certain cons of this feature that are important. True bypass basically lets the natural signal and sound of your guitar through the pedal when it’s turned off. Although this is something you’d generally want to look for, with reverb pedals it’s a different story. When you turn off a true bypass pedal, the actual reverb that the pedal produced gets immediately cut off. This results in a bad sounding effect and simply isn’t something you’d want. Buffered bypass pedals don’t have this problem, but do alter the sound of your instrument while the pedal is turned off. The optimal solution for this problem would be going for pedals that offer bypass toggling, so you can choose which mode you want in different circumstances. Because not all pedals have this feature, I’ll make sure to point out the ones that do in the top 10 reverb pedals part of this article that’s coming up next! How much does a good reverb pedal cost? Who makes the best reverb pedals? Let’s find out! As the absolutely cheapest reverb pedal on our list, at number 1, we have the Rv-10 by Biyang. Although this brand is far from well known, their reverb pedal offers great quality at an absurdly low price point. The interface is, as you’d probably expect, pretty simple. There are 2 big knobs for adjusting the time and blend of the actual effect, meaning the length of the echoes and the dry/wet signal mix. Besides those knobs, you can also use 2 switches for choosing between room, hall and spring reverb presets, as well as 2 versions of the previously mentioned presets. This basically gives you 6 different types of reverb to choose from. Not too shabby for a reverb pedal this cheap! If you plan on using this effect alongside a stereo rig, the Rv-10 has got you covered, as it features stereo inputs and outputs. All features aside, the actual audio performance is what matters the most. How did this pedal stand up to the competitors? Compared to other budget pedals, it’s noticeably better. I’d go as far as to say that the Rv-10 sounds almost like much more expensive, well-known models on the market. If you’re not really sure that this kind of effect is for you and that you actually need a pedal of this kind, the Biyang Rv-10 is definitely your best option. Whether you’re looking for the simplest reverb pedal on the market or one of the smallest, the TC Electronic HOF Mini will probably tick your boxes. Coming from a company known for not only some of the best sounding effects pedals but for solid build quality as well, this model offers great performance for only around $100. The controls are as simple as they can get. One knob for adjusting the dry/wet mix, and a footswitch! You might be thinking, why should you spend double the money you would for the previously mentioned Rv-10 on this model when it seems so limited in features? Well, the HOF Mini has a card up its sleeve. The feature is called TonePrint, and it basically allows you to either create or download existing presets and load them on your pedal. This transforms your one-knob-pedal into a powerhouse that can deliver various different reverb presets when needed. No matter which preset you go for, the HOF Mini sounds excellent, with high levels of clarity and an overall natural impression. If you need different reverb presets at your disposal at all times, this just won’t cut it. However, if you like to experiment, but are fine with only 1 preset at a time, definitely consider getting the HOF Mini. 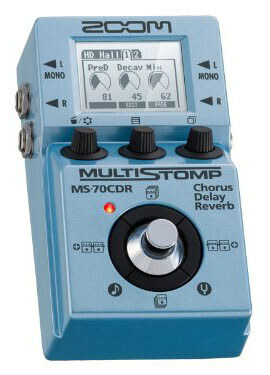 Although Zoom is mostly known for their microphones, their MS-70CDR MultiStomp pedal is a real treat! Unlike the rest of the models mentioned in this review, this one offers reverb, but chorus and delay as well. This little metal box offers not only 3 different effects but also stereo input and output, which was a good decision given the actual effects in question. The actual interface is a bit different as well, with 3 knobs and 4 buttons surrounding the footswitch. Everything you do is visible on a small screen, so cycling through different effects and variations of effects is much more simple. With 29 reverb presets, 26 delays and 16 different chorus types, the MS-70CDR is more of a multi-effect processor than just a regular pedal. But the features don’t end there. You’ve also got a noise gate, tap tempo, trails, as well as EQ controls. With all of its features, the MS-70CDR is probably the best reverb pedal for the money, considering the just over $100 price tag! Next up, we have the Digitech Polara, a reverb pedal that looks as good as it sounds. The attractive design coupled with an amazingly sturdy build makes the Polara a great investment. Each and every component of this pedal simply looks and feels premium, especially the metal knobs. The only downside of the psychedelic design would be, in my opinion, the hard to read labels. However, after just a couple of hours of playing around with it, you’ll memorize what each of the knobs does anyway. While the controls are relatively basic, they offer a good level of versatility. The knobs include level, liveliness, decay and preset select, while an additional switch is used for toggling the trail on/off. The trail feature definitely comes in handy as this is a true bypass pedal. The 7 included presets sound very open and natural, especially when combined with the liveliness control, making the Polara probably the best ambient reverb pedal out there. 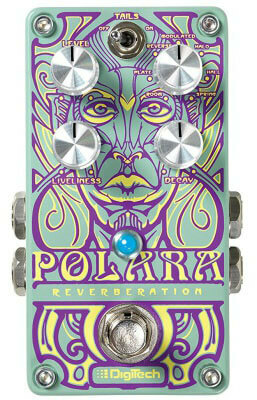 If you’re into experimental or ambient genres, the Polara is a good reverb pedal to consider. Electro-Harmonix is known for making some of the most durable and unique effects pedals on the market, and their Holy Grail Nano is no exception. 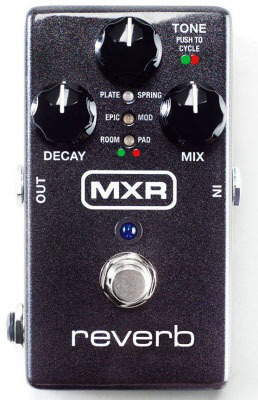 As the name suggests, this is a slightly more compact version of the original Holy Grail, catering to the needs of guitarists with not that much free space on their pedalboards. However, the smaller dimensions of this bad boy don’t affect its performance. The one knob and one switch interface obviously focus towards users that want things nice and simple. The knob is used for adjusting the wet/dry mix, while the switch has 3 positions, spring, hall, and flerb. The spring and hall presets sound very good, while the flerb setting is definitely unique. It’s an interesting combination of flanger and reverb, which not all of you may find to be useful that often, but it’s a neat addition to an already solid pedal. So, who is the Holy Grail Nano for? Basically, anyone looking for a small, great sounding pedal with a unique touch and durable build. No effects pedal review would be complete without at least mentioning Boss. Their RV-6 is regarded as one of the best reverb pedals, at least by looking at online reverb pedal reviews. But how does it actually perform? Connectivity-wise, the RV-6 has got it all. Besides the stereo inputs and outputs, this model also offers an input for connecting an expression pedal, giving you more room for fine adjustments of the effect. The control knobs are straightforward and easy to use, but still extensive enough to satisfy both beginner and more advanced guitarists. Besides the standard level, tone, and time knobs, you can easily choose from 8 different reverb presets. The RV-6 is probably the best shimmer reverb pedal, at least in this price range, and the rest of the presets don’t fall far behind. There is even a neat preset called +Delay, so you could maybe even go without an additional pedal for this effect. The Boss RV-6 gives you a good number of different presets and the ability to easily integrate it with your stereo setup. At number 7 we have the original TC Electronic Hall of Fame. Unlike the mini version of the HOF, the full-sized one has much more to offer. The fact that the HOF offers switchable true/buffered bypass definitely gives you a lot more flexibility than the other models without this feature. Combine that with the stereo inputs and outputs, and you’ve got yourself the best stereo reverb pedal for the money. The level, decay, and tone controls are pretty straightforward, while the fourth knob is used for selecting between 8 preloaded and 3 user-generated presets. As you’d expect from a TC Electronic pedal, this one also features TonePrint which allows you to load pretty much any preset you find online. What really makes this model stand out is its Mash feature. This means that you can use the footswitch almost as an expression pedal, adding the exact amount of the reverb effect as you’d want. 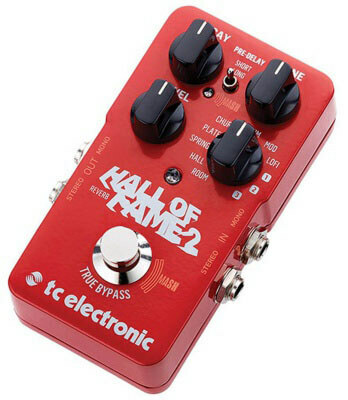 If you like the TC Electronic style and approach, but want something more than the HOF Mini, definitely consider getting the HOF 2! 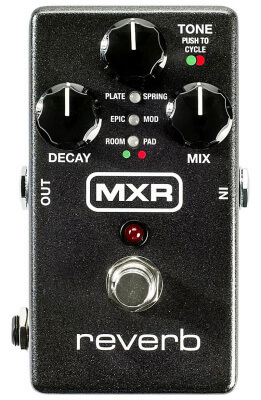 The M300 from MXR is probably one of the best reverb pedals for metal. With its unique audio signature, durable build and above average parameter control, it may just be what you’re looking for. Sure, some of you may not like the fact that this is a digital, and not an analog pedal, but once you’ve heard it, you’ll definitely give it a second thought. First of all, you can connect an expression pedal to it, and easily fine tune the amount of reverb you get at any given moment. Next, the 3 knobs making the interface give you a high level of control over the effect. Mix, tone, and decay are pretty straightforward, and by pushing the tone knob, you can choose the actual reverb preset that’s active. The presets include plate, epic, mod, spring, pad, and room, and honestly, all of them sound pretty tight. Sure, the M300 may not have as many presets as some of the other, less expensive models we’ve mentioned, but if you value sound quality and performance more than simple versatility, definitely give the M300 by MXR a chance. 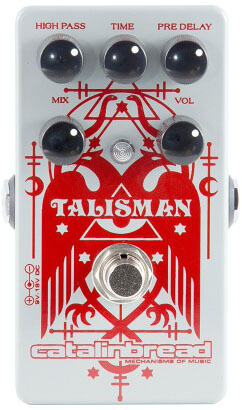 Coming from the same price range as the previously mentioned M300, we have the Talisman by Catalinbread. This is by far the best plate reverb pedal you can get for around $200. So, what’s the deal with plate reverb? What makes it so special? Well, unlike hall reverb, this type gives you a more refined and focused sound. Think of it more like an extension of the riffs and melodies you’re playing. The folks at Catalinbread made the control layout to cater to the actual sound of this pedal. Besides time, pre-delay, mix and volume controls, the high pass knob comes in very handy as plate reverb often needs a slight cut in the lower frequency range. The time knob also goes up to infinity, so you can have your reverbs playing in the background as much as you want. Sure, the Talisman may not have various presets or stereo I/O. But it offers a high-quality plate reverb with a lot of room for experimenting. 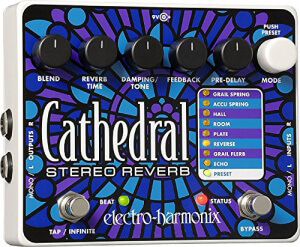 And finally, at number 10, we have the Cathedral from Electro-Harmonix. 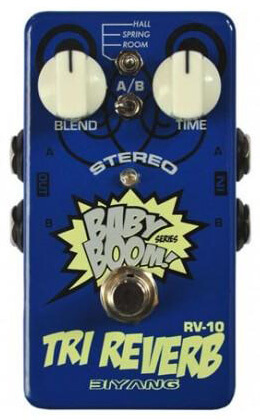 This company is known for making some of the best reverb pedals on the market, and for a good reason. 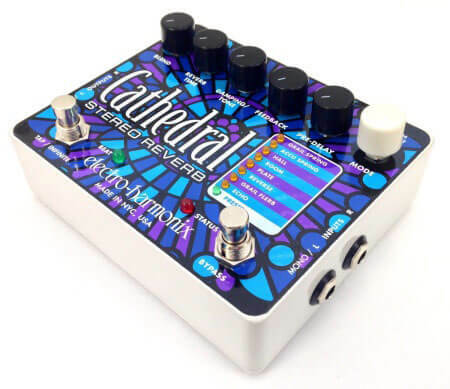 Although the Cathedral is the most expensive reverb pedal on our list, it can easily be used by beginners as well as more advanced guitarists. However, chances are that newbies won’t really be able to appreciate all of the features and excellent sound it provides. In order to fit every component, footswitch, and knob, the Cathedral is on the bigger side of the spectrum, but this also makes it incredibly easy to use. Feature-wise, there’s hardly anything that this model doesn’t have. The 6 knobs include blend, reverb time, tone, feedback, pre-delay, and mode, for actually selecting the preset. And there are great presets indeed. Hall, room, plate, reverse, flerb, as well as 2 types of spring reverb. Besides that, tap tempo and infinite reverb are also featured. What more could you possibly ask for? If money isn’t really a factor, and you want everything when it comes to this kind of effect, you won’t make a mistake if you go for the Electro-Harmonix Cathedral. After all those different models, each with its unique sound, features, and approach, which model should you go for? While your personal preferences are the crucial factor, some pedals definitely take the cake in certain categories. Let’s take a closer look at the breakdown of our list. For under $50, you get what you pay for and even more. 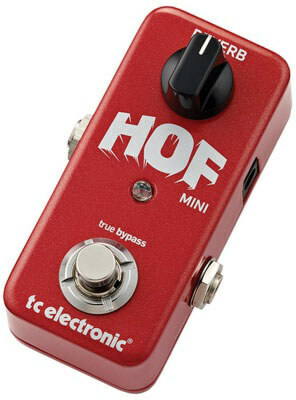 The TC Electronic Hall of Fame Mini is a simple yet effective plug and play solution. The sheer combination of build and audio quality and the fact that it offers a high level of versatility make this model an excellent choice. A good balance between tonal characteristics and various reverb presets. Pretty much each and every reverb pedal feature crammed in a solid and good looking device. Which one did you find to be the best for your needs? This pretty much wraps this article. I hope that now you have a better idea of the reverb pedal you’re looking for.